If you start keeping chickens, then, as well as reading about them on the internet, I would also suggest you get a good general book on chickens to learn more and use as a reference as you go along. I would also recommend you get a good book on Chickens’ Health which can pay for itself many times over when things go wrong (and they frequently do!). 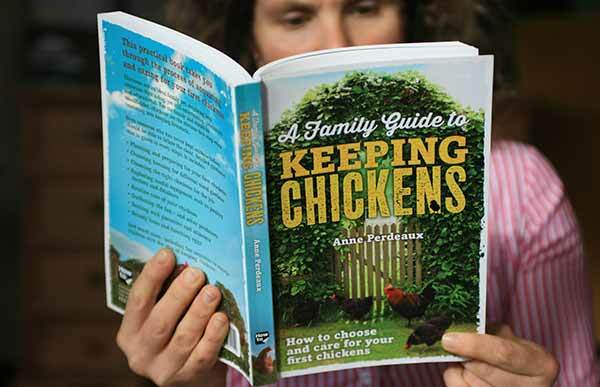 If you are a beginner looking to keep chickens then my recommendation would be Anne Perdeaux’s excellent “A Family Guide To Keeping Chickens: How to choose and care for your first chickens” This is a very practical book that is ideal for the complete beginner. 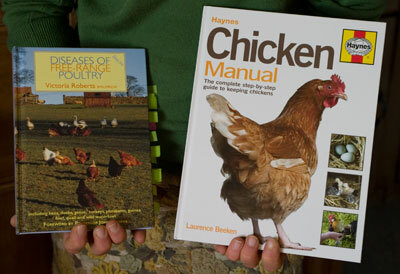 Another book I can recommend as a beginners / intermediate book is the Haynes Chicken Manual written by Laurence Beeken. I wouldn’t be without The Haynes Chicken Manual and Diseases of Free Range Poultry. It covers just about everything you could ever possibly need to know including some more advanced topics on hatching, and showing chickens. For chickens health, there is still really only one book to consider and that is Victoria Roberts ‘Diseases of Free Range Poultry’ which is written by a vet from the UK. The other books I have read have either been very expensive and technical, or aimed at the American market (such as the Chicken Health Handbook). Hi, I have 2 chickens two and a half years old. I have not had eggs from them for the last two months. They are healthy, have grit and are happy. I do get sometimes an egg without a shell. Can you help. It is a common problem. They will stop laying from time to time and don’t lay as much as they get older either. They should come back into lay when they are ready, providing they have the correct diet and are healthy. 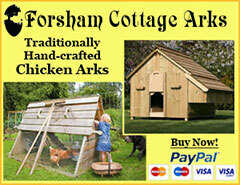 This is a great web-site, and I have learnt loads thank you. I have had 8 ex-batts for 3 weeks now, and they have settled in really well, and I can’t believe how individual they are! However, this morning under the perch in the sleeping quarters was a soft egg. I give them oyster shell in their feed, maybe I should keep a supply in the run for them to help themselves to? Also I was concerned that it wasn’t in the nest-box, apart from the first couple of days when there were eggs in the run, they have been laying in the nest box. Is this something that happens from time to time? Yes, you’ll get the odd soft egg, especially from high production hens like ex-batts. It’s nothing to worry about. Hi there, couple of things, My chickens wont lay in the next box and i dont know hot to encourage them to, or if i should leave them where they do? Also the oldest of my bantums was laying and now has gone broody, i’ve tried taking her out of coop regularly, check she isnt sitting on anyone elses eggs, but she still not laying, do i get her some eggs to hatch or do i persiver with what i’m doing? Make nest boxes dark and place dummy eggs in there. This should encourage them to lay there. 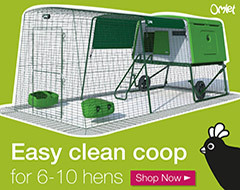 For broody hens, you can use a dog crate without the bottom on a cold floor (garage?). Provide food and water but no nesting material or paper. Pop her back in the coop at night. After a few days she should be fixed! Hello, I wonder if you have any advice on a broody chicken, we have had six hens since april this year (we had them from 16weeks old) we have all different breeds, oneof them is a speckled hen and she go’s broody regular as clockwork once every month for a anything up to 5-6 days. we put her in a dog crate untill she snaps out of it. we were told that it is triggered by warm weather so we were hoping that now the weather is turning colder that would be the last of it untill next summer, but she went broody again yesterday near enough 30 days after the last time. she is the only chicken we have that does it. 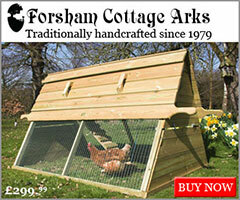 is this just a common occurance for this breed of hen? or just one of those things, will she stop being broody in the winter. any tips and advice most appreciated. thanks again for a superb website. That does seem a little excessive. Most good broodies will go broody 3 or 4 times in a year. Most will stop this over the darker winter nights. Other than putting her in the sin bin as you are doing, I am afraid there isn’t much else I can suggest. we are getting 5 chickens for the 1st time in a couple of days. will i need to clip their wings? Probably not. Most breeds can’t get off the ground but Mediterranean breeds can fly quite well. Leghorns for example. I would see how you get on first. Remember if you do that you should only clip one side to unbalance them and only when the feathers are fully grown. The quills must not have any blood in them. hi can you help i have 8 chicks approx 5 weeks old they are growing rapidly and look to have all there feathers on there necks and wings, untill now we have kepted them in the shed under a heat lamp in a rabbit hutch converted. You need to wait for the feathers to grow fully – look at the primary wing feathers, in the quill, you will see blood when the feathers are growing (they will look black). Hi, we have had our 4 hens for a couple of weeks now, all seem healthy and happy (so they should if you could see their run and coop, Sky TV comes next week…!!!!!! We are getting two small eggs daily, not sure whether from Isa Browns or the two Nero’s. I’m sure it wont be long until we get a full house. After all these preamble my question concerns them pooping in the nesting boxes at night whereas the floor of the coop remains spotless! Anything we can do about this or do we just carry on? They dont lay until I have cleaned the nesting boxes in the morning..!!! You can put small boxes in the nestboxes in the evening so they can’t get in. Also make sure perches are higer than the nest boxes – they naturally want to get up high. You really need to discourage it because of the bacteria that can get onto your eggs. Sometimes they will do this… keep an eye on her but if she continues to do it, I would put some dummy eggs in the nest box, darken it slightly by hanging an old feed sack over the top half of the nest box to encourage her to lay here. I got 4 chickens about 5 weeks ago. They are quite amusing and fun to look after. 2 weeks ago I got my 1st egg, small but perfect. After a few days there were 2 eggs per day and 3 on the odd day. However today I had 1 large egg with a soft rubbery exterior that had got broken, one small egg with the same type of “shell” or rather lack of, and one about the size of a large marble, again with rubbery outer. I’m concerned that one of my girls may not be well or it could be from a hen that has just started to lay. It seemed odd to have 3 out of 4 eggs deformed in this way. Any advice? This is fine, don’t panic. 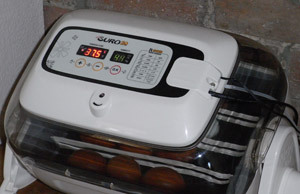 The ‘Wind Egg’ as it is sometimes called can come at the start or end of lay – especially in high production hybrids. The little egg is basically a little something that came down the oviduct and got wrapped in white and shell as if it was an egg. It only contains White / Alubumen. hi, i have noticed that one of my chickens has lost feathers from under her tum/chest also they stay in the nest box all night to sleep together, could this be causing the feathers to come off and she looks a little sore, no red mites or lice. It’s hard to say – sometimes it can be as simple as feathers being rubbed off but more often it can be moulting (hens will sometime moult partially in the summer) or it can be feather picking by others. Keep a close eye and see if you can get any more clues. Hens do start to look a bit ragged at this time of year until they moult and grow their new feathers.